A column of GORF and SADFUKR troops attacked and defeated a small ZSA force near the town of Zulado this week. They failed in an attempt to take the ZSA barracks in Fort Zulado but are now in complete control of the area to the south west of the town and have severed ZSA communications along Highway 9. 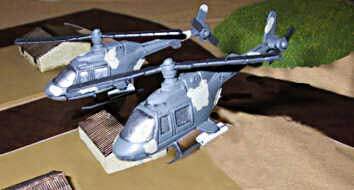 The ZSA border protection force, deployed in an area which has been peaceful for several months, was caught by surprise by this unprovoked attack and they were heavily outnumbered when the battle was opened by a pair of SADFUKR attack helicopters. The helicopters stayed over the battlefield throughout the fighting and destroyed two ZSA armoured units, one of armoured cars and one of tanks. The GORFS and SADFUKRS soon took their primary objective, a range of hills overlooking Highway 9, the main road west from Zulado. But an elite SADFUKR infantry unit was completely destroyed by infantry fire almost immediately after heli-inserting close to ZSA positions on Hill 232 a feature which totally dominates the the road from Zulado town to Fort Zulado. ZSA troops heroicly defended Fort Zulado throughout the day, supported by two tanks. The tanks were eventually destroyed by overwhealming numbers of GORF troops - some five armoured cars, the same number of tanks and a unit of French professional infantry were drawn into the attack. As night fell a GORF tank crashed through the fort gates and entered the courtyard, but it later withdrew under cover of darkness when its crew realised that support was not forthcoming. 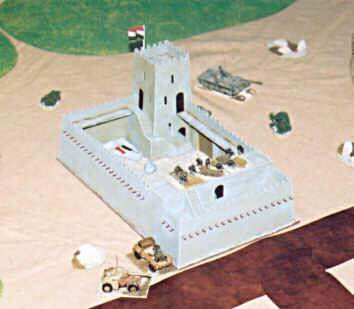 The ZSA unit deployed in the Fort held their positions overnight..
Hill 232 was the scene of much bitter fighting throughout the day, and units from both sides suffered heavy casualties and routed as the struggle raged. Control of the hill was still being contested as night fell.